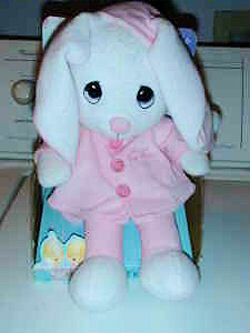 The Precious Moments white bunny I am looking for is a stuffed rabbit doll wearing a pink sleepy hat and a sleepy coat. It was purchased at Walmart 8 years ago. My daughter has loved her all that time and has never spent a night away from her. Sleepy hat is gone as well as sleepy coat. The bunny can’t hold his neck up anymore. I would like to surprise her with a new or gently used one when she’s older. used…. ebay item number 370094616513 good price. Just in case you want a back up. I just came across this. Thanks, Susan. Traci wrote me back to say she had already found a backup and wouldn’t be needing this one.